The "I" is your retirement income, and the "E" is your expenses. The goal is to develop reliable sources of retirement income that cover your living expenses, no matter how long you live and no matter what happens in the economy. The goal may seem overly simplistic, but it's much easier said than done. In your retirement years, health care and long-term care expenses are the wild cards that can blow up any retiree's budget, and they deserve special attention. Most retirement planners focus on the "I" part of the formula, which is only half of the story. To make sure you have sufficient resources for retirement, you've got to determine the right balance between income and expenses, a balance that will make you happy and meet your needs, both before and during retirement. Before you retire, any excess of "I" over "E" represents savings, most likely for your retirement. I advocate that you make conscious decisions about the tradeoff between spending for today and saving for your future. Need motivation? Most of us have older friends or relatives who are struggling in their retirement years and wish they had saved more and spent less. Learn from them. 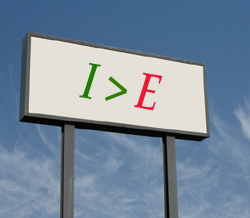 Many of my posts have provided strategies for maximizing your "I" and minimizing your "E" for the rest of your life. These strategies aren't rocket science; they're mainly common sense. I aim to remove the mystery surrounding retirement planning, so you can apply your common sense. Planning wisely for your retirement simply means making every dollar count on both sides of the magic formula, and using all the resources available to you -- financial and non-financial. Given that we're talking about the quality of the rest of your life, I advocate that you make the effort to manage the magic formula for retirement security. Here's a fun story about the magic formula. Once I was giving a retirement planning workshop with a group of rocket scientists, and one of them commented, "Steve, that's not a formula, it's an inequality!" Well, he was right, but the phrase "magic inequality" doesn't quite have the same ring to it. "Annual income twenty pounds, annual expenditures nineteen six, result happiness. Annual income twenty pounds, annual expenditures twenty pound ought and six, result misery."